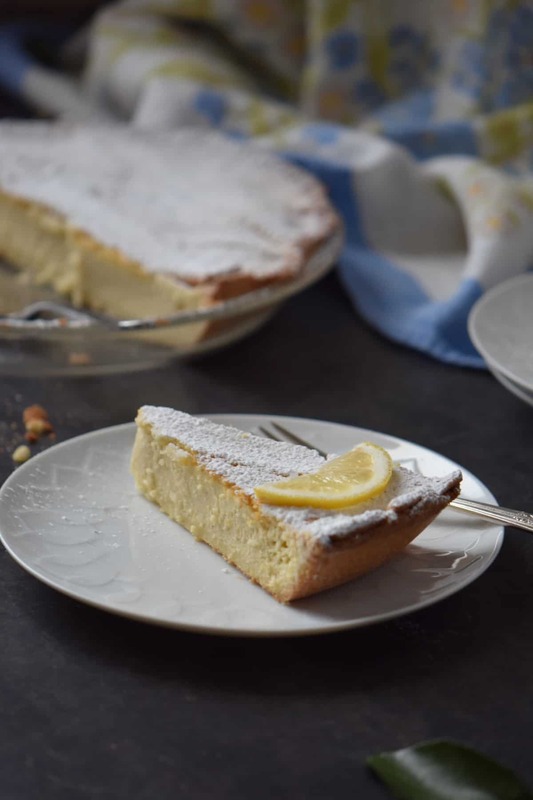 Home » Easter » Ricotta Pie: Perfect for Easter! This post was originally published on March 24, 2016 and republished on March 15, 2019 with updated content, photos and more recently a video (located in the recipe card). Thanks for watching and sharing! I don’t know about you but I love ricotta cheese dessert recipes! I’ve had this Italian pie recipe bookmarked for such a long time. I finally got a chance to try it and I am so glad that I did! As you can see, there are two parts to this ricotta cheese pie: a crust and a filling. 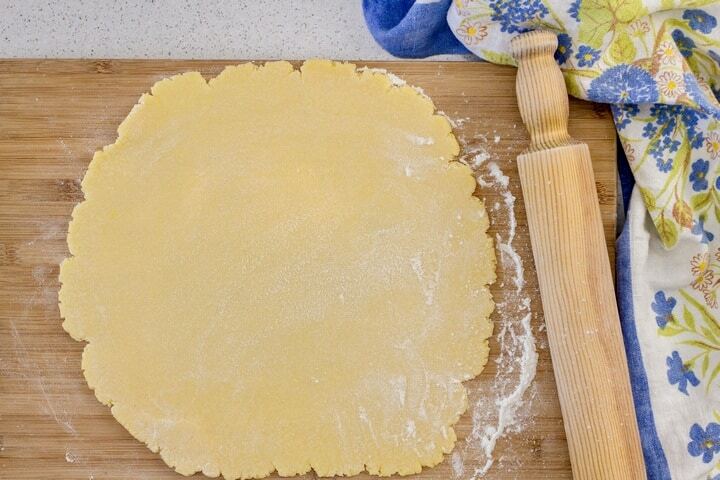 The dough, an Italian sweet short crust pastry (also known as pasta frolla) is widely used as a base for tart and pie shells. 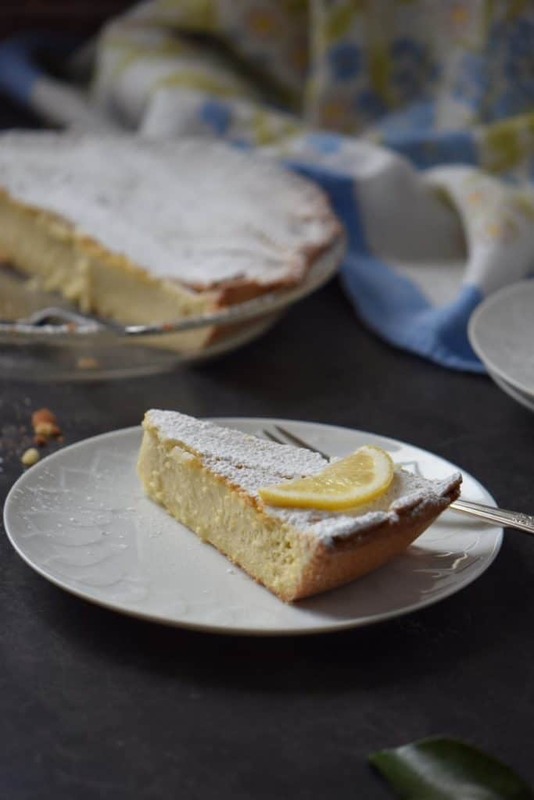 I used a variation of this pasta frolla to make this Italian Ricotta Chocolate Tart recipe, and another no butter variation when making this Italian Jam Tart. The filling for this easy ricotta pie consists of sweetened whipped ricotta and eggs and it is simply delicious. 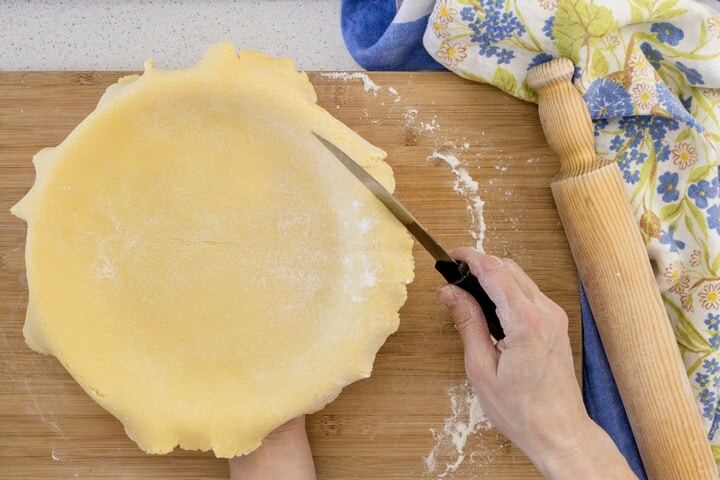 Let’s begin by making this simple pie crust recipe. Pasta frolla is very easy to prepare and comes together in no time. This whole process will literally take about 5 minutes. Simply pulse the dry ingredients with the cold butter in order to obtain a coarse texture. 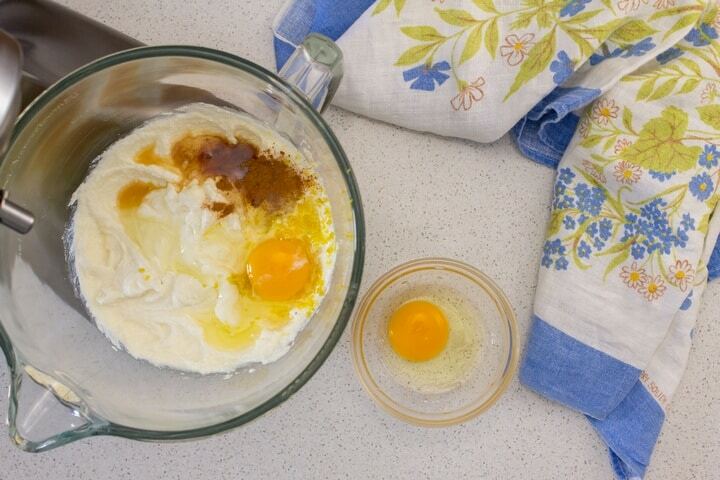 Add a slightly beaten egg and then pulse until the mixture begins to come together. It might take up to 20 pulses… don’t give up, eventually the dough will form into a ball. 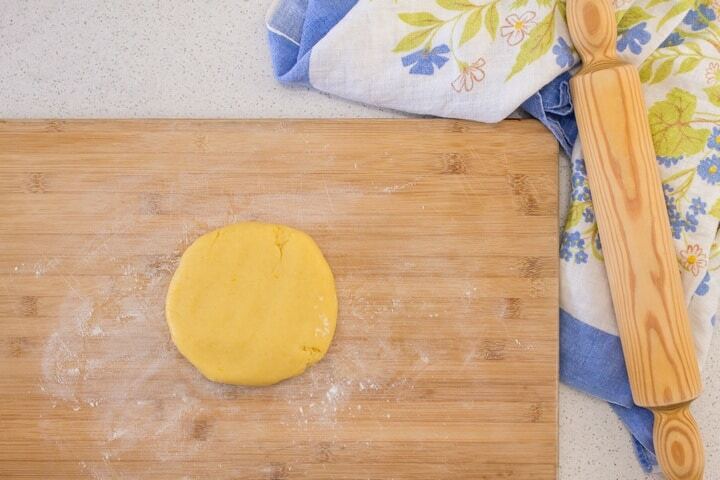 Turn out the dough on a floured wooden board and form into a smooth round disc. Wrap it up in cling wrap and refrigerate for at least 1 hour. (Dough can be refrigerated for up to three days or frozen for one month). This ricotta filling recipe is equally quick and easy to prepare. One by one, incorporate all the ingredients together in your stand mixture. If you’re feeling bold, you can try making your own Homemade Ricotta Cheese (you can click on the link to see for yourself just how easy it is to make). It’s important to scrape down the sides of the bowl and to properly incorporate the eggs, one at a time. It should take you less than 10 minutes to complete this part. Now it’s time to roll out the dough (about 1/8 inch thick). Fold the dough in quarters and place it in your 9-inch pie plate. Next, unfold the dough to fit your pie plate. 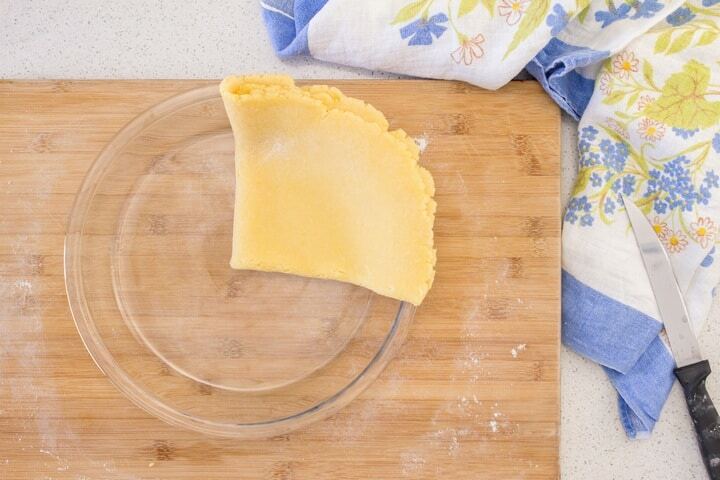 With a sharp knife, remove the dough that is overhanging from the sides. If you have never rolled out dough before, this is a great recipe to begin with; it is an extremely forgiving dough. Pour the filling in your pie pan. (Please note that if your ricotta filling is not yet made, refrigerate your prepared pie shell until ready to be filled). I tried to remove air bubbles in ricotta mixture by dropping the pan gently on my counter top. As far as the lattice top is concerned, you can take it or leave it. This Italian ricotta pie is equally great-tasting and great-looking without it. I re-rolled the extra dough and cut some strips that I placed on the top of the pie. 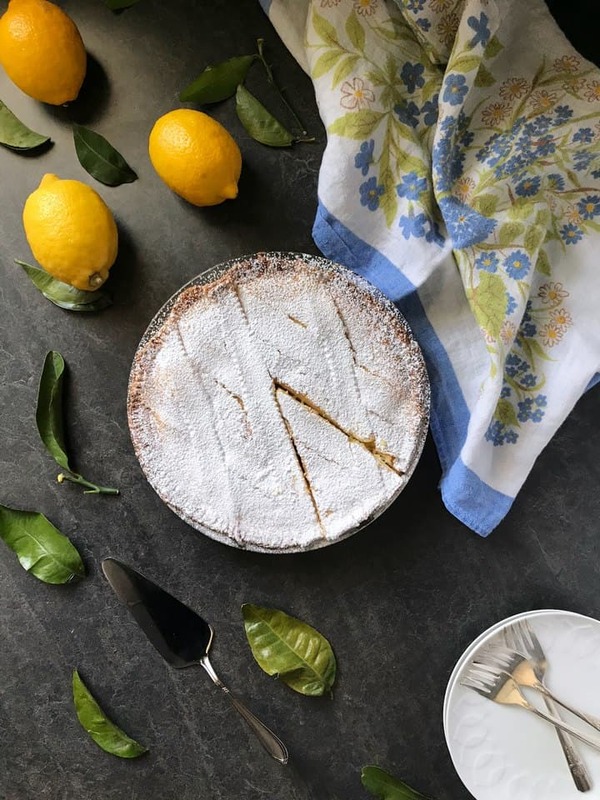 Place your pie on the oven grate located on the bottom third of a preheated oven, and in less than one hour you have a perfect Easter ricotta pie! Serve the sweet ricotta cheese pie at room temperature in wedges. Use cold butter when making the crust, this is a must. 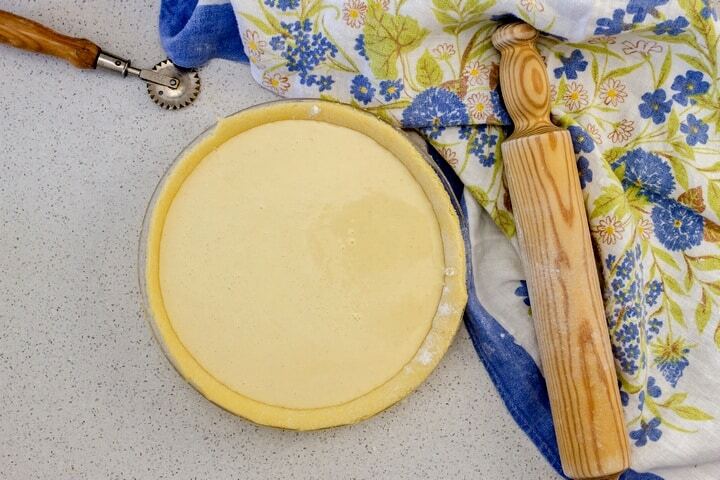 Do not over manipulate the pie crust dough; once it comes together, form in a disc and refrigerate. Drain the ricotta as we do not want a soggy crust. You can prepare the pie 24 hours in advance and refrigerate until needed. Does Ricotta Pie need to be refrigerated? If you serve the pie the same day you make it, no, simply serve at room temperature. Otherwise, cover with cling wrap and refrigerate up to 2-3 days. When ready to serve, bring to room temperature. As you can probably guess, Italian tradition dictates having an Easter pie. So much ricotta…so little time! More Easter recipes can be found in the Easter Category. Without a doubt, one of my favorite bakers is Nick Malgieri. (If you recall, a couple of weeks ago I shared his recipe for the strudel dough in the recipe for a Simple Italian Ricotta Cheese Strudel). Today, I have adapted one of his recipes for this baked ricotta dessert. You can watch him make this pie by clicking on this link. 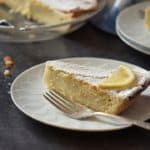 A few of my friends have stated that this pie tastes exactly like a Sicilian ricotta cheesecake. No matter what you call it, one thing is for sure, if you like ricotta (like me), you’ll love this recipe! ★★★★★ If you have made this Ricotta Pie Recipe, I would love to hear about it in the comments below and be sure to rate the recipe! This recipe for a Lattice Topped Ricotta Easter Pie can easily be prepared in advance until ready to be served. Perfect for an Italian Easter celebration. In a food processor combine the dry ingredients and pulse a few times. Add the cut up butter and pulse until the mixture resembles coarse ground meal. Add the slightly beaten egg and pulse until the dough starts coming together. On a lightly floured wooden board, turn out the dough and form into a smooth disc, by pressing dough together. Wrap in plastic wrap and refrigerate for 60 minutes. Meanwhile, in a large mixing bowl (of a stand mixer) beat the ricotta on low speed with the paddle attachment until smooth (approx 30 seconds). Make sure to scrape down the sides of the bowl a few times. Slowly add the sugar and continue to beat for another 30 seconds or so. Add the lemon zest, cinnamon, liquor and 1 egg. Beat until the egg is properly incorporated. Remember to scrape down the sides of the bowl. Continue to add one egg at a time, making sure to properly incorporate into the mixture and scraping down the sides of the bowl. Set aside while you roll out your dough. Preheat oven to 350 °F (175 °C). Place oven rack to bottom third. 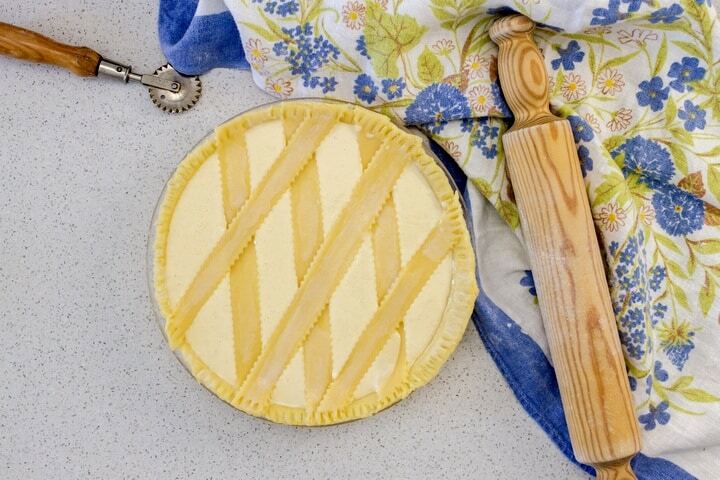 Roll out the dough to fit your pie plate. Thickness should be about 1/8 of an inch. Carefully fold over and fit into your pie pan. Pour the filling into a 9-inch pie plate. Optional step: Decorate with strips of dough and brush tops of dough strips with milk. Bake for approximately 40 minutes or until the center filling is set. Place foil on the edge of crust to prevent over-browning. Recipe will yield one 9-inch pie. A serving size is 1/8 of the pie. It can easily be prepared 24 hours in advance and refrigerated until needed. Amazing recipe. No only difference I did was that I made the pastry by hand and also stirred the wet ingredients together by hand. Ill definetly be making it again. Tazzy, I’m thrilled to hear you enjoyed this ricotta pie. Thanks so much for taking the time to comment, appreciate it! Top of the pops ! Really ! Your ricotta pie looks perfect, and just in time for Easter. Thanks so much Linda ♥ It has quickly become a family favorite. Hi Maria, can a cooked ricotta tart be frozen and and defrostd when needed? This looks delicious. Would it be impossible to make the dough in my kitchen aid stand mixer? Thanks Regina 🙂 To be honest, I don’t think there is enough of the ingredients for the stand mixer to “work” the ingredients together. 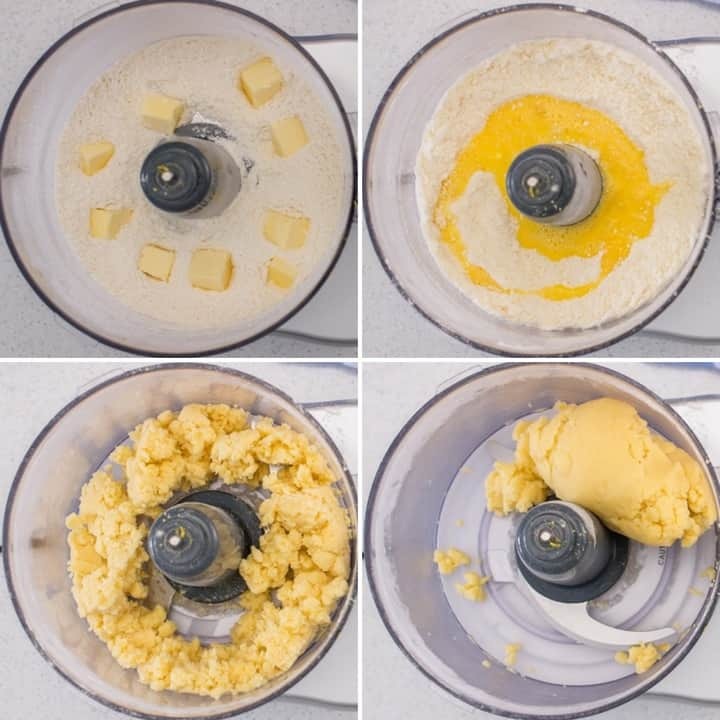 I would recommend to work the flour and butter together with your fingertips in a bowl and slowly incorporate the rest of the ingredients… the mixture comes together rather quickly. That is a really great question, thanks for asking Regina. You hit me on several fronts here. Nick M is one of my favorites and, of course, I love ricotta. My family never made this, but it looks beautiful. Too bad about the food processor. I couldn’t live without mine for long. In fact, I saw my exact model Cuisinart that I paid a lot for at a garage sale recently. It was brand new with the attachments for $10. I bought it as a backup. Now I feel secure. I so appreciate your posts. Happy Easter!